Harry Phibbs stood nervously facing a crowd of four hundred and fifty of his constituents. “I’m here to…” he began. But the resident next to me interrupted. “Listen!” she muttered - guessing his ploy - just moments before Cllr. Phibbs (Con) uttered that word too. A quiet laugh rippled across the immediate quarter of the room. This incident captured the mood at last night's meeting. Nobody believed that their concerns were being heard. H&F Council’s consultation on the new Town Hall development is a cynical affair. Days earlier, Phibbs had written to the Evening Standard to tell its readers that “the scheme is to be welcomed”. His full-throated support for the project echoed that of his boss, Cllr. Stephen Greenhalgh (Con), the Leader of the Council. Cllr. Greenhalgh had reluctantly spoken at the meeting just ten minutes earlier but only after the Chair had spotted him lurking at the back of the room. He said he would “look into concerns about the size of the buildings” but spoke in a manner that implied it was news to him that the scheme now included two fourteen storey skyscrapers. Greenhalgh too had asserted that he was in “listening mode” but it was hard to see what this “listening” would produce. Over the last four and a half years Cllr. Greenhalgh’s Administration has developed a close relationship with developers. It has met them on numerous occasions both in the UK and in Cannes on the French Riviera. It is evident that the Administration has been out-negotiated at every point. 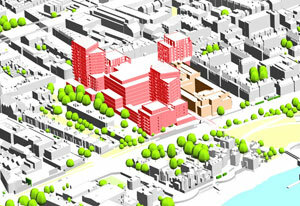 Now, we have a proposed scheme likely to blight central Hammersmith for many years to come. I was a member of H&F’s cabinet when officials first brought forward a smaller scheme for this site six years ago. Cllr. Mike Cartwright (Lab), ex-Councillor Chris Allen (Lab), others and I argued against it and it was quashed. I recall being shocked at the officials’ unseemly enthusiasm for the shiny new Town Hall offices it would provide. When in 2005 I became Deputy Leader of the Council, I told officials to halt all work on the project and that the demolition of the cinema and Pocklington Trust flats would not be given the go-ahead on my watch. It was therefore a surprise when, one year later, the newly elected Conservative Administration embraced a bigger scheme with such energy. They had vigorously campaigned against demolishing those buildings just months before. H&F's Conservative Administration is now seeking to make this into an issue about whether or not we regenerate Hammersmith, King Street and demolish the ugly Town Hall Extension (built by a previous Tory Administration). But residents have a more sophisticated series of objections as these comments demonstrate. I have never known a time when all of the residents' associations in the area are so united against anything. But the question is still how can residents make this Administration listen to their concerns? Firstly, I think it’s important that residents meet with Administration councillors, insist they disclose all about H&F Tories' murky negotiations with developers and engage the Administration on the details of the scheme. My Opposition colleagues and I will do all we can to support this. Secondly, I think the Administration needs to recognise that significant numbers of local people will continue to object to these awful plans. I recall one senior Administration member dismissing scornfully “the poxy number of objectors” when only forty or so residents attended another planning meeting. That same Conservative Councillor was pale with anxiety when over two hundred and fifty local people came to demonstrate their objections at a different planning meeting. Last night, there was almost twice that number of residents attending the Save Our Skyline meeting. On previous occasions there have been over a thousand people attending other public meetings. In short, this Administration needs to see and understand that its current plans for the Town Hall redevelopment are completely unacceptable to very large numbers of Hammersmith and Fulham’s residents. Possibly, and only then, they may actually begin to listen… We are, after all, living in a democracy. If you would like to join the residents' campaign you can email Save Our Skyline directly by clicking here. Something about Cllr Greenhalgh's apprent remarks at the meeting remind me, for some reason of that famous scene in Casablanca where Peter Lorre tells Bogart that he's shocked to discover that there's illegal gambling going on while pocketing his winnings. Likewise, Cllr Greenhalgh: I'm shocked, shocked, to doscover that someone's proposed a fourteen story building overlooking the river. And just in time for the likely collapse in the property market.